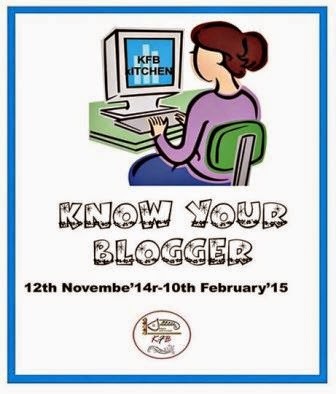 Gradually, we are almost at the end of the event,"Know Your Blogger-2" of Kolkata Food Bloggers, only few are left. 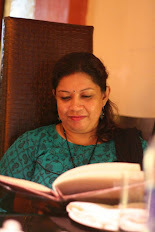 Any way, today I'm going to introduce you to Antara Ray who blogs at Antypasti, not so regularly but quite often after managing her 9-5 job as a Management consultant. Her blog is a chronicle of her travel stories (she is a frequent traveller too) along with lots of interesting food from different parts of the World. You will also find very quick and healthy meal ideas from her blog as she is a working girl and manages home and office simultaneously. I recently had a chance to meet her for little time at KFB's Annual Bake Sale and I was very glad to finally meet her. Antara, hope to meet you again soon. As a rule, I'm supposed to pick a recipe from her blog and make it in my kitchen. But I found many interesting recipes form her blog, and finally decided to cook this one out, which is Baked Rigatoni in meat sauce. My daughter and me both love pasta and when I checked this recipe on her blog, I just drooled and went ahead hurriedly to the kitchen. Luckily, I had all the ingredients it needed. 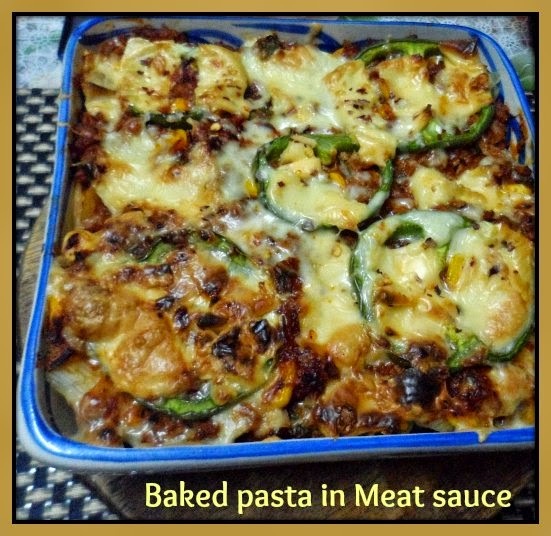 Actually, I tried Italian Bolognese pasta, which is someway similar to this recipe, only difference is that this one is baked and Bolognese pasta is cooked on stove-top. But I never tried Baked pasta with meat sauce. So, I just followed her recipe, there she added readymade pasta sauce, which I didn't have, so made a fresh tomato puree and went ahead with rest of the recipe. I cooked a whole lot of pasta for this, so made 2 layers of pasta and meat sauce while assembling the baking pan, so that sauce can spread evenly to each pasta. Tomato sauce : 2 tblsp. Dried Rosemary : 1 tblsp. Cook the pasta according to package direction until just done. The pastas should not be overcooked. Heat 1 tblsp. olive oil in a pan, add sliced onion, diced capsicum and fresh corn. Saute for 2-3 minutes, then add grated garlic and wait for 1/2 a minute before you add keema or minced meat to the pan. Saute for couple of minutes. Season with little salt at this time. Then add pureed tomatoes along with tomato sauce. Add red chilli flakes, rosemary and salt and black pepper to taste. Your meet sauce is ready. Now take a baking pan, drizzle little olive oil allover, first arrange 1/2 of the cooked pastas as a first layer, then our 1/2 of the meat sauce over them. Again arrange last 1/2 of the pastas over the meat sauce and lastly rest of the meat sauce and cover the whole pan. 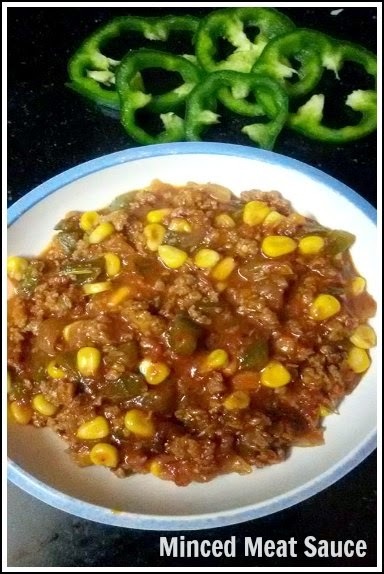 I placed few capsicum rings over the last layer of meat sauce and covered the baking pan with grated mozzarella cheese. 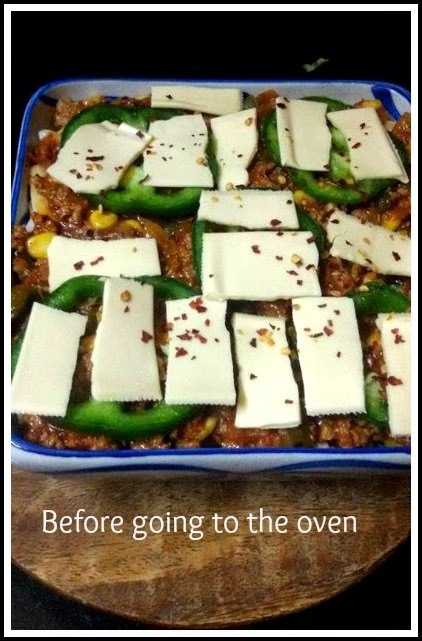 Pre-heat your oven in 180 degreeC and bake for about 20 minutes or your cheese melts and browns a bit. you can add your choice of vegetable here. Sending this to Kolkata Food Blogger's Ongoing event, "Know your Blogger-2".